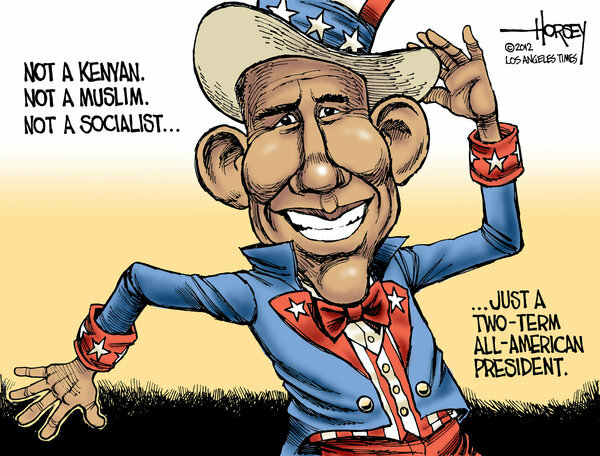 David Horsey's recent column makes some salient points on President Obama's victory on Tuesday. I'm not so sure, however, that the GOP is quite ready to take them into consideration. The people have spoken. President Obama has won a chance to move beyond the stunted progress of his first term and, perhaps, become a historic president. On the losing side, the Republican Party remains shut out of the White House and has blown a chance to take over the U.S. Senate, largely because it catered to the narrow concerns of tea party zealots and social conservatives who imagined themselves as the only authentic Americans but who are, in fact, way out of step with most of the people in this country. The problem is that the GOP still controls a number of state houses and legislators. I anticipate continuing efforts to suppress the vote via voting list purges and draconian identification card requirements. I also think that voter intimidation and voting machine tampering will continue. Unless and until stiffer laws are drafted and enforced on vote suppression, intimidation, and fraud, the GOP figures it will still have a shot at keeping the control of country in the hands on the white male 1%. Convicting some of these yahoos and giving them hard time might make a difference we all can live with. Until then, the GOP will continue with the likes of the Tea Party and Mitt Romney.